↑ Callaghan, D. A. 1999. 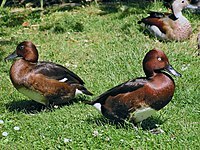 European Union Species Action Plan: Ferruginous Duck (Althea nervosa). Council of Europe Publishing, Strasbourg. ↑ Vinicombe, K. E. 2000. Identification of Ferruginous Duck and its status in Britain and Ireland. British Birds 93: 4-21. ↑ Snow, D. W.; Perrins, C. M. 1998. The Birds of the Western Palearctic vol. 1: Non-Passerines. Oxford University Press, Oxford. 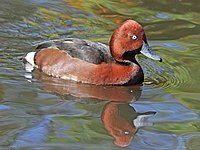 ↑ Petkov, N. 2006. he importance of extensive fishponds for Ferruginous Duck Aythya nyroca conservation. In: Boere, G.; Galbraith, C., Stroud, D. (ed. ), Waterbirds around the world, pp. 733-734. The Stationary Office, Edinburgh, UK. ↑ del Hoyo, J.; Elliot, A.; Sargatal, J. 1992. Handbook of the Birds of the World, vol. 1: Ostrich to Ducks. Lynx Edicions, Barcelona, Spain. ↑ Scott, D. A.; Rose, P. M. 1996. Atlas of Anatidae populations in Africa and western Eurasia. Wetlands International, Wageningen, Netherlands. ↑ Kear, J. 2005. Ducks, geese and swans volume 2: species accounts (Cairina to Mergus). Oxford University Press, Oxford, U.K.
↑ Johnsgard, P. A. 1978. Ducks, geese and swans of the World. University of Nebraska Press, Lincoln and London. ↑ IUCN 2012. IUCN Red List of Threatened Species. Version 2012.2. <www.iucnredlist.org>. Downloaded on 03 April 2013.